If you’re stressed out, depressed, feeling unfulfilled or just bored with your life, you aren’t alone. That means that approximately 66% of us are just going through the motions of living (or worse), rather than actively enjoying our lives. But it doesn’t have to be that way! You can be happy! There are so many things you can do to be happier, more excited about life, and an all-around better person. As someone who has struggled with severe stress issues, depression, and a way less than perfect self image, I want to share with you the tips that have helped me the most in my endless search for happiness. No matter what your situation is, no matter how long you’ve felt the way you feel, and no matter how you’ve tried to be happy before, know that you can be happy. Here are a few ways you can actively pursue you own happiness ideal. Jon Gordon, author of a simple yet life-changing book called The Positive Dog, says that it’s nearly impossible to be both stressed out and thankful at the same time. His suggestion: when you start feeling stressed, anxious, or depressed, think about all the things in your life that you’re thankful for. Every little thing. Be thankful for the roof over your head, your family, your friends, and the opportunity to make money at your job. Literally everything you have is something to be thankful for. Start doing this daily and you’ll be able to minimize your negative feelings and make room for the positive ones. You get to do laundry because you have clothes to wear, unlike many children in developing countries. You get to pay rent because you’re lucky enough to have a roof over your head. When you start using this trick, you begin to see just how fortunate you really are – and how small even your biggest stressors can be. Okay, stay with me on this one. At the risk of sounding like a pre-teen, keeping a journal of your feelings is a great way to get some perspective on your life! Mainly, if you focus on a single thing that you want to change – an attitude, a behavior, or even a relationship – you can analyze out how you handle that obstacle on a daily basis and track the ways that work best for you to improve it. For example, to manage my stress, I started a stress journal and wrote down everything that stressed me out as it happened each day. At the end of the day, I took 10 minutes to write down how stressed I felt on a scale of 1-10 for that day. I also wrote down ways that I could improve those feelings and what my goals were for the end of the week (i.e. to turn a consistent stress rating of 9 into a 4). I swear, within a single week my stress had dropped off significantly. While not everyone may see the same results within the same timeframe, this is a great way work toward a happier life. Do you want to learn a new language, go back to school, find your soul mate, or move to another country? Don’t let anyone tell you that the things that you want out of life aren’t possible. You only get one life, so why spend it doing things that you aren’t passionate about? Do what you want and you’re sure to be happier and feel more fulfilled in no time. Finally, one more great way to be a happier person is to always work toward a better you. Don’t confuse this with a negative self image of who you currently are. Rather, accept and love yourself for exactly who you are right now and work to give that perfect person an even better future. Try a new exercise routine, learn a new skill, or volunteer to help others. Even if your efforts don’t result in any major life changes, you can still feel great knowing that you’re always striving for improvement. These suggestions are just the tip of an endless iceberg. Research shows that there are many things you can do to boost your happiness and get greater satisfaction out of your life. 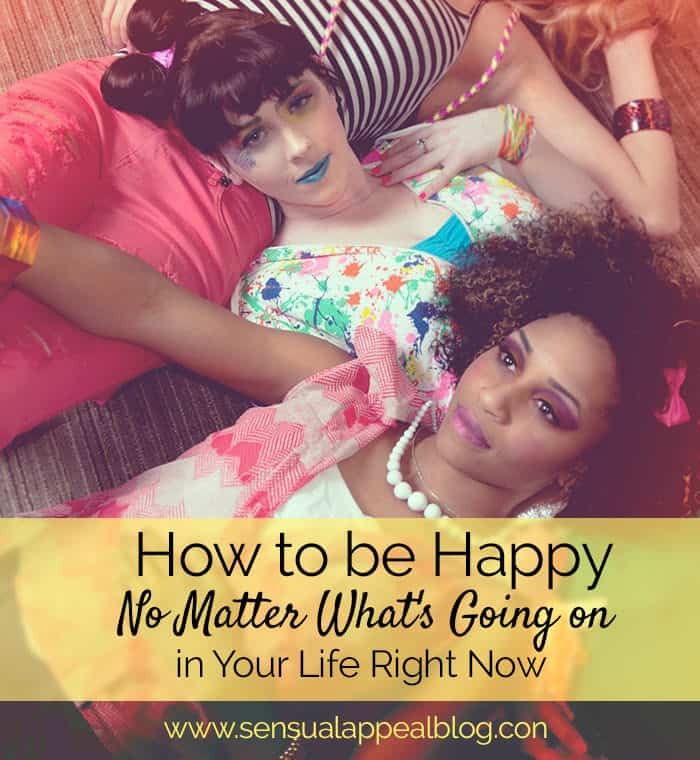 How do you try to be a happier you? Kayla Matthews is a productivity blogger with a passion of healthy living and helping others. Check out her blog Productivity Theory to read all of her latest posts! Kayla Matthews is a Green movement enthusiast and productivity blogger. Check out her blog Productivity Theory to read all of her latest posts! It has taken me quite some time to get here, but I try to celebrate and embrace the little things in life…a fresh coat of new, pretty nail polish; a relaxing bath with the most divine scent from a bath oil or bath salts; a cup of my favorite coffee savored in complete silence. I guess it all relates to your first point…be thankful or happy for the little things and then the big things so unbelievably over-the-top blissful! I am such a big believer in being thankful for what we have. Another trick for me is encouraging others — that is an instant mood boost! These are such great tips. I’ve really been trying to work towards a happier lifestyle – I recently heard the “get to” instead of “have to” tip too – sometimes its hard to convince myself its better and not something I HAVE to do… but its definitely helping. I struggle with depression and stress as well so I really identify with this. Thanks for posting! Thank you for sharing, Amalia. Little steps, one at at time. You’re doing great! xo Much love. I always remind myself of how thankful I am for everything I DO have in my life and it works quite well to get me through the crummy days! I love that…. change the have to to GET TO! Oh I LOVE the tip about changing “have to” to “get to” even just the words make me feel more grateful. I remind myself of how lucky I am by expressing gratitude for every little thing. I’ve been working on this a lot over the last month or so. I actually realised I was wearing my stress and overwhelming workload as a badge of honour and it was making me miserable. I’m kicking that nasty habit to the curb with some self love and gratitude. The behavior journal is a great idea. I love journaling, but doing it in a more mindful way would probably be super helpful! I’ve always been an optimist. Even when things aren’t going well I try to keep things in perspective.